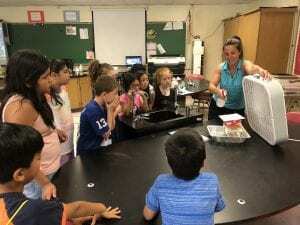 The South Orangetown Central School District hosted a record 362 campers for its third annual Summer STEAM Camp, July 2-13! The half-day summer program began in 2016 with just 200 SOCSD students in grades K-8 and has rapidly grown to meet community demand. The program, which is offered at no cost to SOCSD families whose children attend WOS, CLE, or SOMS, is coordinated by Instructional Science Coach Samantha Levine (K-8), School Social Worker Jessenia Cursio, and taught by SOCSD teachers. Twenty-eight teachers from across all four schools signed on for this year’s STEAM Camp, and created exciting, hands-on projects to engage campers in everything from bird-watching to 3D printing pancakes to creating stop-motion videography. Thank you to the South Orangetown community for supporting our Summer STEAM Camp program! Check out the district Facebook feed for more 2018 SOCSD STEAM Camp photos. Use #SummerSTEAMCamp to search posts!